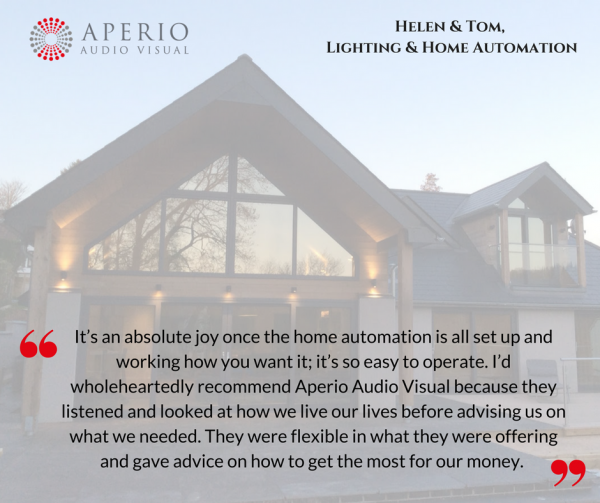 While developers were building their new home, Aperio Audio Visual were hired by these homeowners to install home automation. The family’s goal was to benefit from heating and lighting efficiency savings as well as enjoying the audio-visual experience of streaming music and TV around their entire home. Aperio Audio Visual consulted on the system design and pre-wiring before installing the system. They integrated the smart home features using Control4 to simplify everything through a single remote, mobile phone or tablet at home or away from home. Their clients are delighted with how easy it is to use the system and have given Aperio Audio Visual a glowing recommendation for their services. You can read more about their side of the story over on Aperio AV’s website – where the story was developed from our interview with their customers. With a goal of gathering anecdotal customer insights, we designed the interview questionnaire to seek constructive feedback as well as the testimonial. In-depth conversations with customers can inform your plans for improving the business at the same time as helping you attract new customers. If your business development team needs high-quality assets to share with prospects, book in for a free consultation. We’ll review how to boost your Content Marketing using genuine customer feedback.